NASA launched another of the world’s most advanced weather satellites on Thursday, this time to safeguard the western U.S. 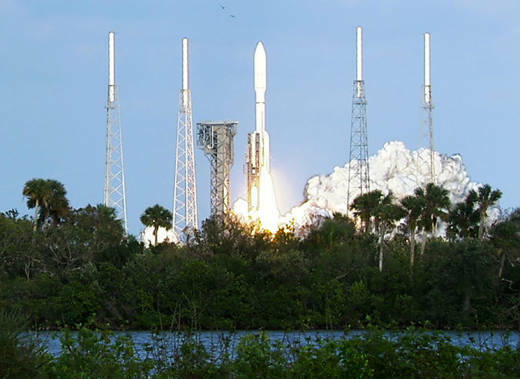 The GOES-S satellite thundered toward orbit aboard an Atlas V rocket, slicing through a hazy late afternoon sky. Dozens of meteorologists gathered for the launch, including TV crews from the Weather Channel and WeatherNation. GOES-S is the second satellite in an approximately $11 billion effort that’s already revolutionizing forecasting with astonishingly fast, crisp images of hurricanes, wildfires, floods, mudslides and other natural calamities. The first spacecraft in the series, GOES-16, has been monitoring the Atlantic and East Coast for the past year for the National Oceanic and Atmospheric Administration . The same first-class service is now coming to the Pacific region. Besides the West Coast, Alaska and Hawaii, GOES-S also will keep watch over Mexico and Central America. It will become GOES-17 once reaching its intended 22,000-mile-high orbit over the equator in a few weeks, and should be officially operational by year’s end. “We can’t wait!” tweeted the National Weather Service in Anchorage just before liftoff. With these two new satellites, NOAA’s high-definition coverage will stretch from the Atlantic near West Africa, a hotbed for hurricane formation, all the way across the U.S. and the Pacific out to New Zealand. It’s the third weather tracker launched by NASA in just over a year: “three brilliant eyes in the sky,” as NOAA satellite director Stephen Volz puts it. GOES-16 launched in late 2016 and an environmental satellite rocketed into a polar orbit from California last November. These next-generation Geostationary Operational Environmental Satellites, or GOES, are “a quantum leap above” the federal agency’s previous weather sentinels, Volz said. This is the 18th launch of a GOES since 1975; one was lost in a launch explosion and all but three of the satellites are retired. Even as it was still being checked in orbit, GOES-16 provided invaluable data to firefighters battling blazes in Texas, Oklahoma and elsewhere last March and to Houston-area rescue teams in the flooded aftermath of Hurricane Harvey last August, according to officials. GOES-16 also observed the uncertain path of Hurricanes Irma and the rapidly intensifying Hurricane Maria in September. As Hurricane Harvey approached the Texas coast, the satellite revealed the clouds sinking in the eye and the eye expanding as the storm morphed from a category 2 to 4, Uccellini said. Those images helped determine when it was safe for rescue teams to go out and save stranded residents, he added. Two more are planned in this four-satellite series: GOES-T in 2020 and GOES-U in 2024. The $10.8 billion cost includes the development, launch and operation of all four satellites as well as ground systems through 2036.